Music is one such deep-rooted human achievements which can evoke emotions and manifest feelings too. The charms of music have delighted, allured, and motivated numerous listeners across the world. It exists in every corner of the nature. There might be hardly anyone who is untouched by music in some way or the other in their lives. During our visit to Government School, Kodigehalli, Karnataka, we met with one such girl, Shanta, who has a passion for singing and a melodious voice too. A Standard IX student, Shanta comes from a family of five members. Her father works as a weekly wage earner at a construction site and is the only breadwinner for the family. Her elder sister had to discontinue education after completing Standard XII and her younger brother is studying in Standard VII. Despite of all these, she had a spark when we talked to her about her dream. She told us that she has not received any formal training in singing. 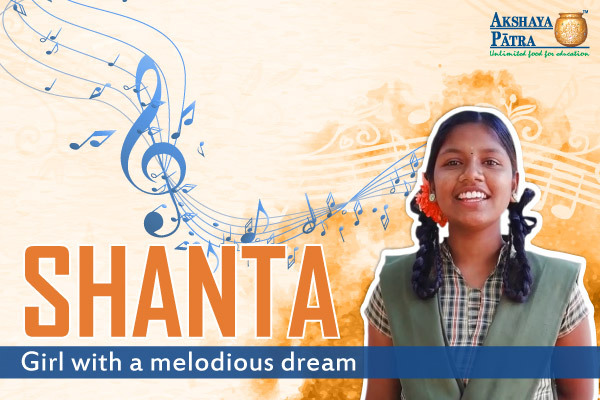 However, for Shanta, singing is not just a vocation, it is a soothing dream that she wants to live with for the rest of her life. Well, if without any training Shanta can sing so well, just imagine what wonders she can do with professional training? Indeed, having an inborn talent to sing is a wonderful gift! Shanta also shared with us, how she has been enjoying the mid-day meals served by Akshaya Patra since the day she joined school in Standard I. We, at Akshaya Patra are proud to be in service of such ambitious and determined children. Join our endeavour and witness the glory of blossomed dreams.